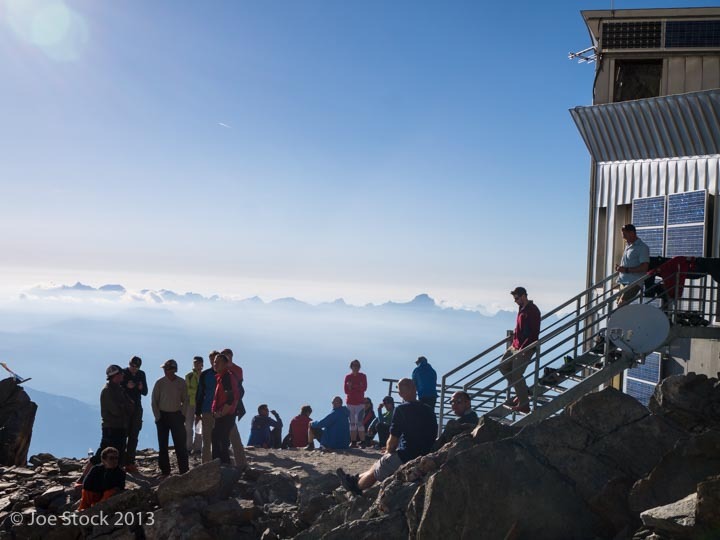 Near the summit of Mont Blanc, our clients huddled together and discussed the route ahead. 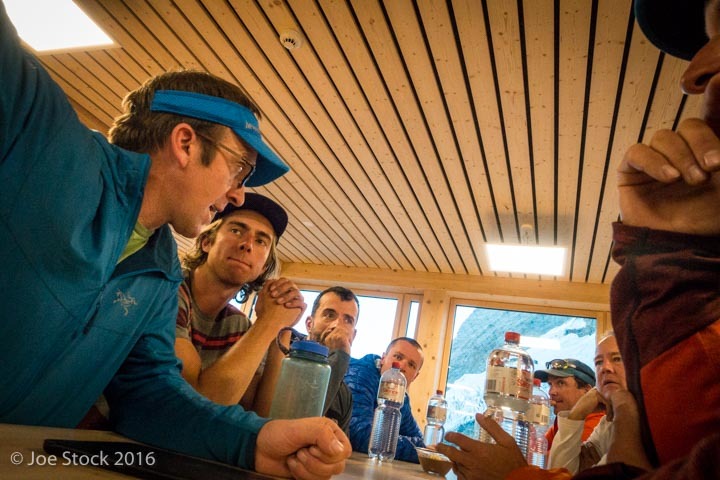 The night before, at the Tête Rousse hut, co-guide Matthieu Desprat spent an hour telling them about the route. They knew the next section to the summit was steeper, exposed to higher wind and lower oxygen. They also knew that the summit was only halfway to safety. They were tired and the wind had increased. Among themselves, they decided to turn around and try again another day. This was an ideal situation; the guide presented the necessary information in advance and the clients felt the decision was their own. Discussing the route at the Refuge de Tête Rousse, Mount Blanc, France. Mountain guides say their job has three parts: to minimize risk, to achieve the client's objective and to show the client a good time. Within these jobs, one of the more difficult is to manage the client’s expectations about an objective. Descending from an unreached summit with a disgruntled client is a bad situation for any guide. So what makes the difference between clients who agree to turn back and those who blame the guide for their failure? Managing client expectations takes maturity and practice. It's a skill that some career guides have mastered and newer guides should be aware of and work toward. The following are some techniques for managing client expectations. Some of the concepts are borrowed from business. Others are unique to guiding. 1) Discuss objectives and risks. First of all, try to understand your clients’ objectives—just as competent doctors listen to their patients before prescribing treatment. Before the trip, ask them what they want to get out of the trip. Say, for example, "What is your goal for this trip?" or "Do you want to spend time on skills or focus on an objective?" With a better understanding of your client’s desires you can present options that better match their desires. Explain the pros and cons of each and incorporate their ideas into the decision. If their expectations are unreasonable, give them enough information about the objective so they can see that another objective is better. Also, before the trip, discuss risk with the client. Review the dangers that will be encountered. Explain that you cannot make the trip safe, but your priority will be to minimize the risks. Explain that returning alive and in one piece is paramount and that any final decision is yours. Problems arise when a client does not respect or accept the guide's decision. Help alleviate the problem by pointing out and explaining the hazards and reiterating the trip priorities as you go along. Clients may also have a different risk tolerance than the guide. For example, if the guide feels uncertain about the snow stability and turns the group around, but a client wants to keep going, the client either has not been well informed about risks or the client has a greater risk tolerance than the guide. In this the latter case, the guide-client relationship is not compatible. On future trips, the client may be better suited to another guide with a higher risk tolerance. 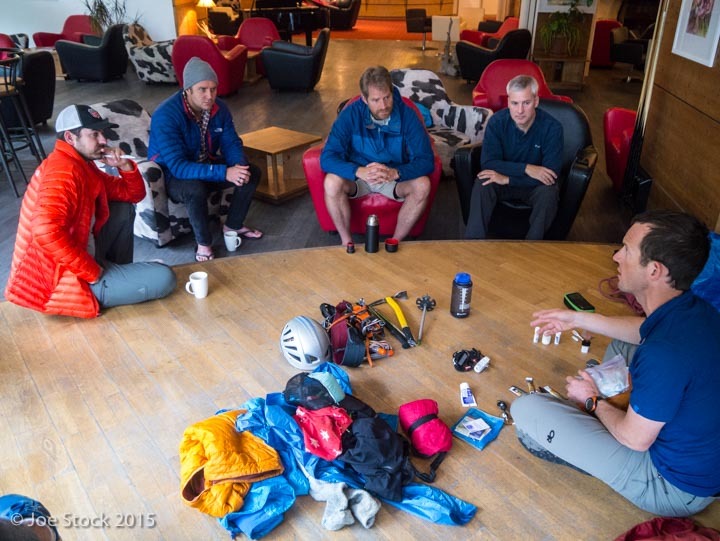 Dylan Taylor briefing clients at the Hornli Hut the evening before climbing the Matterhorn, Switzerland. Before the trip, keep the clients informed through a pre-trip letter. When possible, be available on email or by phone. This communication helps replace trip anxiety with trip anticipation. At the pre-trip meeting, look at the weather forecast, avalanche advisory and maps together. This gives the client a clear mental picture of the route and conditions. Continue to frontload communication throughout the trip. Provide information before each day and at each transition, just as you make a plan before crossing avalanche terrain. Armed with more information, the client will have a more accurate perception of the risk and will be easier to work with. Newer clients often want concrete answers, such as being told they will get to the summit. They can have a difficult time understanding the uncertainties encountered in the mountains. If clients have high expectations and those expectations are not met, they will be disappointed. If clients have lower expectations and are surprised with a success, they will have a better experience. To reduce their expectations, make promises you can keep. Like, "I will make my best effort to get you to the summit, but the summit is not guaranteed." Forewarn them that the summit is one of the possible outcomes. Use phrases like, “Remember that the summit is only halfway.” Remain non-committal by using terminology like, "Let's go up to 9,000 feet and look at our options." Keep an attitude that concentrates on the journey, not the destination, so the summit is not the singular goal. 4) Make decisions with clients. Forest McBrian discussing the gear in his pack before a trip. A guide's job is managing risk with good decision-making; the guide has the final call with all safety decisions. While this is a powerful position, the experienced guide includes clients in many decisions. From the start of the trip, include clients in decision-making. The earlier the better. This serves to enhance their appreciation for the challenges and lessen their disappointment if an objective cannot be achieved. Select the route with your clients. Seriously consider any suggestions they make; they are often good. As IFMGA Mountain Guide Willie Benegas wrote, "Clients are your climbing partners, decision making should be done as a team." This invests them in the trip and they are better prepared to switch to plan B or C if needed. The ultimate goal is to have clients make key decisions themselves. If the guide provides the clients with the right information and uses gentle nudges (indirect suggestions), the clients can feel the decision is theirs. This empowers the clients and leads to a better group dynamic. The wisdom of groups was illustrated by Lior Zoref, who brought an ox onto the TED stage. Each person in the audience submitted their guess of the ox's weight. The low guess was 308 pounds. The high guess was over 8000. The average was 1792. The ox's true weight was 1795. 5) Help clients cope with failure. What if you fail to reach an objective that your client really wants? If the client is adequately prepped, it won’t be a shock. IFMGA Mountain Guide Kathy Cosley says that if a client's failure is due to their own limitations (such as lack of fitness or skill), use tact and come up with suggestions and a training schedule for the next attempt. If mountain conditions (external factors) are the reason for the failure, then the situation is more straightforward. Reassure them that the mountain will always be there, but it can't always be climbed on their terms. Tell them that's why it's called mountaineering, not summiting. Despite your best efforts, sometimes a client will be upset and time may be the best remedy. It's easy to keep a client happy when things are going well. Your guiding skills are truly tested when the plan goes awry. It takes diligence to hone your skills at managing client expectations, but it's worth it. It will lead you to the grail of mountain guiding: return clients and lasting friendships. Ideal objective and alternates identified? Route and maps viewed with client? Client knows that minimizing risk is your priority and the final decision is yours? Client encouraged to focus on the journey, not just the destination? Avalanche advisory viewed with client? Companion rescue reviewed with client? Tour plan reviewed with client? AMGA Professional Members Forum, Facebook.com (accessed July 3, 2015). Mountain Craft. Arc'teryx. (August 29, 2015). The Top Five Tips for Managing Client Expectations, by Annie Pace Scranton, Forbes.com, (accessed July 3, 2015). The Wisdom of Crowds, by Lior Zoref, TED, (accessed July 3, 2015).